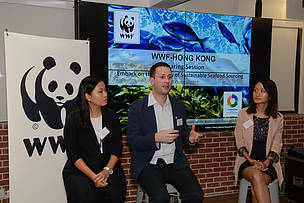 WWF-Hong Kong organized a business event called “Sharing Session – Embark on the Journey of Sustainable Seafood Sourcing” with the support of the Hong Kong Hotels Association (HKHA). This is the first time we have held a sharing session targeting members of the hotel body. The sharing session gathered chefs, representatives of Food and Beverage, Corporate Social Responsibility and Purchasing Departments of 11 hotel groups, including some newcomers to the sustainable seafood journey. The aim of the session was to discuss the latest status of global fisheries and the trend of sustainable seafood sourcing. It was also an opportunity to discuss the possibility of collaboration with WWF in guiding its members who were just starting on the sustainable seafood journey. Gavin Edwards, Conservation Director of WWF-Hong Kong, opened the session by stressing that overfishing, alongside with marine pollution, global warming, marine litter, is a key area that humanity needs to address to restore the balance of the world’s marine ecosystem. Patrick Kwok, Executive Director of Hong Kong Hotels Association strongly encouraged members of the association to embark on a sustainable seafood procurement journey with WWF in order to safeguard the ocean’s resources. In recent years, more and more environmental groups, locally and globally have been benchmarking and exposing hotel brands that are underperforming in terms of seafood sustainability. 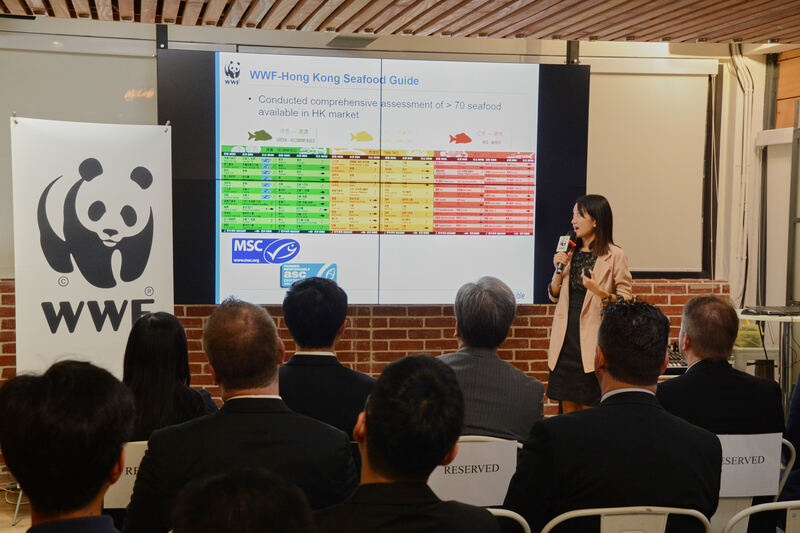 Gloria Lai, WWF-Hong Kong’s Programme Officer for Oceans Sustainability explained that if hotels are not careful about the sustainability of seafood they source, they might expose themselves to high reputational risk. “Although more sustainable seafood ecolabels are now available in the market, there are very few we can recommend. 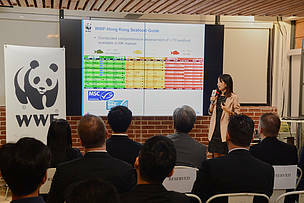 Hotels should work with WWF-Hong Kong on a holistic sustainable assessment and devise a sourcing strategy to ensure that the seafood is sustainably and responsibly sourced, hence reducing the risk”, Gloria said. “Hong Kong is 10-15 years behind the UK in terms of sustainable seafood sourcing”, shared Tom Burney, Executive Chef of Invisible Kitchen and Managing Director of Hong Kong Personal Chef Limited. Tom, who has worked in different restaurants in the UK, gave some perspectives on the experience of sourcing sustainable seafood overseas, especially in terms of supermarket and restaurant practices. Tom also explained that although more caterers here are following sustainable seafood practices, hotels could take a much more prominent role. The government is also an influential player in raising awareness of sustainable seafood practices. The government is currently considering recommendations from the Council for Sustainable Development (SDC), submitted in June, on boosting public awareness. Last year seafood was one of the main focuses of an engagement campaign on the sustainable consumption of biological resources undertaken by the SDC. Dr Winnie Law, Associate Director of Policy for Sustainability Lab of Faculty of Social Sciences of the University of Hong Kong discussed the four key areas of recommendations to give participants insights of the government’s vision to promote the sustainable use of biological resources. Globally about 90 percent of our commercially important fisheries are already fully or over-exploited, but together, we can turn the tide! WWF-Hong Kong urges more hotels to join the movement to keep the momentum going and to restore our ocean resources hand-in-hand!